With great sadness we have to report that Michael MacDowel passed away yesterday at the age of 83 after a prolonged illness. In recent years, Michael will be known to many BRDC Members as one of the Directors who devoted a great deal of his time in helping to steer the Club through the choppy waters of the early 1990s and, having completed his full term of nine years as a Director from 1992 to 2001, continued to serve the Club as a trustee of the Benevolent Fund on which his conscientiously thorough reports were a feature of every AGM until 2014. 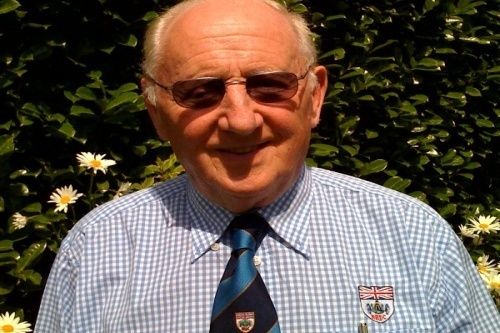 Michael was elected to the BRDC in 1955 after finishing 10th overall and first in the 1100cc class of the last Dundrod Tourist Trophy, then a round of the World Sports Car Championship. Michael had been invited by his good friend Ivor Bueb to share one of the factory Manx-tailed Cooper-Climax T39s but their success was overshadowed by the fatal accident to fellow Cooper driver Jim Mayers early in the race. Ivor the Driver’s invitation had come on the back of Michael’s club racing successes in a 1172 side valve Ford-engined Lotus Mk IX and he switched to Cooper for the 1956 season, with good results including a win at Oulton Park and a notable fifth overall and second in the 1100cc class at Goodwood on Whit Monday behind Colin Chapman, Mike Hawthorn, Jack Brabham and Cliff Allison. From 1957 Michael raced only sporadically but he remained as quick as the regular race drivers on test days. One of his last races was in the Coombs Ferrari 250GTO in the 1963 Whitsun Trophy at Goodwood when he finished second to Ferrari factory driver Michael Parkes. Over the next 15 years Michael became one of the most successful competitors in the British Hillclimb Championship in a variety of ameliorated proprietary chassis from circuit racing. In 1973 and 1974 he won the title, on the second occasion with an almost perfect score of nine wins from the 10 rounds in his 5-litre Brabham-Repco BT36X. A couple of years later Michael worked with Tyrrell F1 designer Derek Gardner to create the Coogar, based on the ex-Larry Perkins European F3 Championship-winning Formula 3 Ralt RT1 but with a 3.3 litre Cosworth DFV engine installed. At the end of the 1970s Michael quietly retired from front-line active participation but retained his involvement in the sport as a member of the RACMSA Motor Sports Council and Chairman of its Speed Events Committee for which no one could have been better qualified. The BRDC extends its profound condolences to Michael’s family. A service of thanksgiving for Michael's life will be held at 14:00 on Thursday 11 February 2016 at St Michael and all Angels Church, Bishops Cleeve, Cheltenham, Gloucestershire, GL52 8BA after a private cremation service. A gathering will follow at the Bugatti Owners Club Clubhouse at Prescott Hillclimb - GL52 9RD approximately three miles from the church. If any Members would like to attend please contact Lisa Benamore for further information on 01327 850 922. Michael's family have requested no floral tributes be sent and would prefer donations in lieu to the Benevolent Fund.